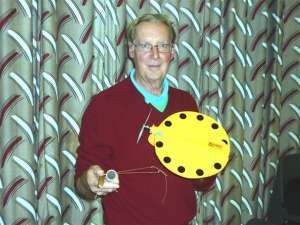 One under construction from Ian Middlemiss (9th October), a finished version From Ted S. which he was itching to fly indoors at Impington. Plus a freeflght conversion from Tony Beckett, underpowered at Impington but with a larger motor to be fitted for its next outing. I'm so pleased to see the "Mercurian Mite" is already stirrring up ideas and emotions. This is EXACTLY the sort of response I was hoping for. Remember there are 12 bottles of the finest wine up for grabs at the Old Warden Mayfly in 2012. It would be good if a fair percentage went to PMFC members. What do you have to do? 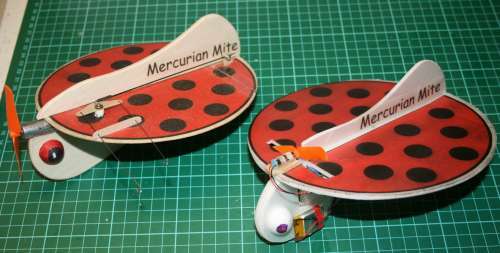 Just build a Mercurian Mite to plan, or scale up to a maximum size to handle a 1.5cc motor or electric equivalent. Please ensure you retain the plan and side elevation profiles. With regard to engine bearers, etc. you may alter to simplify if you wish. 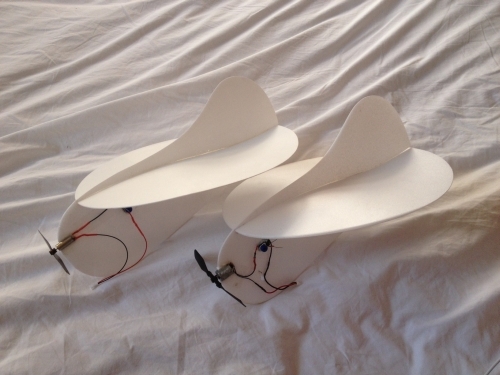 As a guide, typical early saucers using 1.5cc motors, had a diameter of 15" and flew on 40-45 ft.lines. Remember you can use ANY engine between 0.5 to 1.5cc or electric equivalent. 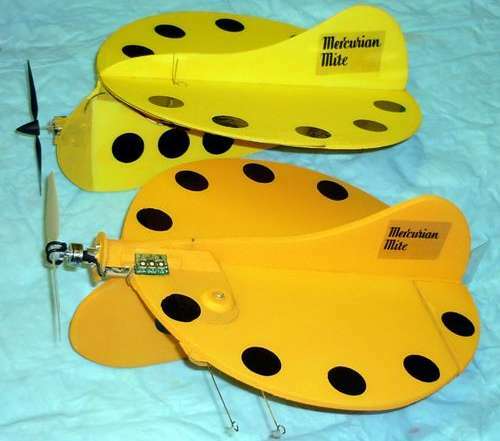 The 0.5cc powered "Mites" were flown on 15-20ft lines. Building time may be all of a couple of hours, and the cost the square root of not a lot. When you have built yours just decorate with some amazing colour scheme that will make it an eye catching spectacle in the air. 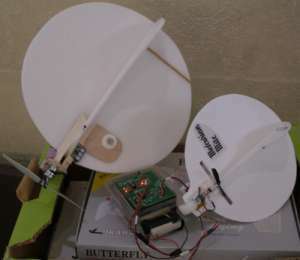 The great thing is, if you do not fly control line, you do not have to attempt to fly your creation. The rules allow proxy pilots to wizz your creation into the air while you sit in comfort and admire your handywork from outside the circle. 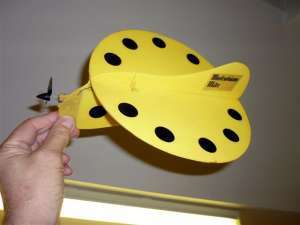 For those more daring souls there is plenty of help available in PMFC for you to fly your own wizzing saucer. 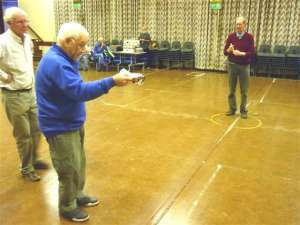 There is plenty of support available in the club if you need a bellcrank, lines and a handle for your creation. Of course you can always make your own bellcrank and handle if you do not wish to purchase anything. What is the idea behind all this madness? Well I'm hoping we can create a control line copy of the successful "Ebeneezer" event held at the Mayfly. 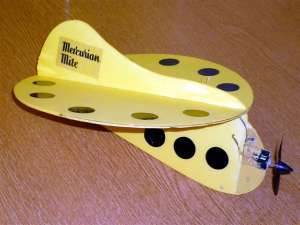 If your amazing creation is selected to fly in front of the assembled crowds, and manages to circulate to the cheers of all then you have a good chance of a bottle of wine and will go down in aeromodelling folk law as a "Mercurian Mite Marvel" complete with certificate to prove your amazing feat. I am also organising a photo shoot for all builders, models and pilots to grace all the major magazines in full colour to show anyone who did not attend just what they missed! To introduce a slightly more serious note to proceedings we are under threat of losing model flying at Old Warden after 2012. I'm hoping to swell the numbers through the gates to let Old Warden management think twice about the future of model flying at their venue. Please e-mail me photos. of your "Mite" so I may publish them in SAM 35 Speaks and also Model Flyer,AMI ,RCME and BMFA News. So what are you waiting for? 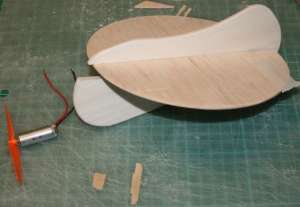 Reach for the balsa, glue and knife and knock yours out by tomorrow evening. Good luck and thanks for your anticipated support. Since 'The Brians' intend to milk the PR angle of the MM in the interests of OW attendance, it behoves the electric faction to promote the club as much as possible. To this end my MM has to use a Peterborough timer with say a 90-120 sec run time. For me, this limits the motor to a 12gm GWS can motor running a 4.5 x 3 GWS on 2 cell LiPo. Flying weight will be <40gm. This PU spec puts my Dave Goodenough Bee upstairs on a 45 degree climb......so worth a punt, especially as a Dart equipped MM will weigh at least as twice as much. So, MM team race with electric vs IC? The other incentive for the PU is to show Kevin that the PU x 4 would be a much better alternative to 4 x KP01. Cheaper, lighter, and quiet. Had a bad night dreaming about Anzani Morgans, Keift race cars and a shop full of machine tools that I have not got room for. This morning, could not settle to planned work (making foam model boxes) so indulged myself with a FF MM , spurred on by Tony B.
AUW 16.4 gms and 2.5 hrs to make start to finish Shown here with the CL stablemate. 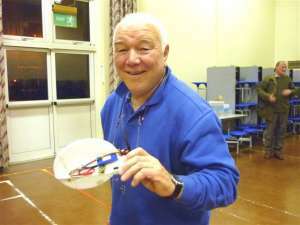 Will fly FF MM at Whittlesey. - Click for the picture. The paint is still wet and it flies great !!! Construction : 3mm Depron with a 1gram Pboro Fet timer, 90 ma single Lipo, one of those Minium gearbox motors from a broken Cessna. 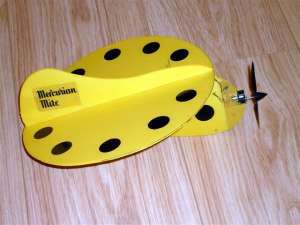 outrunner powered Mercurian Mite control liner.